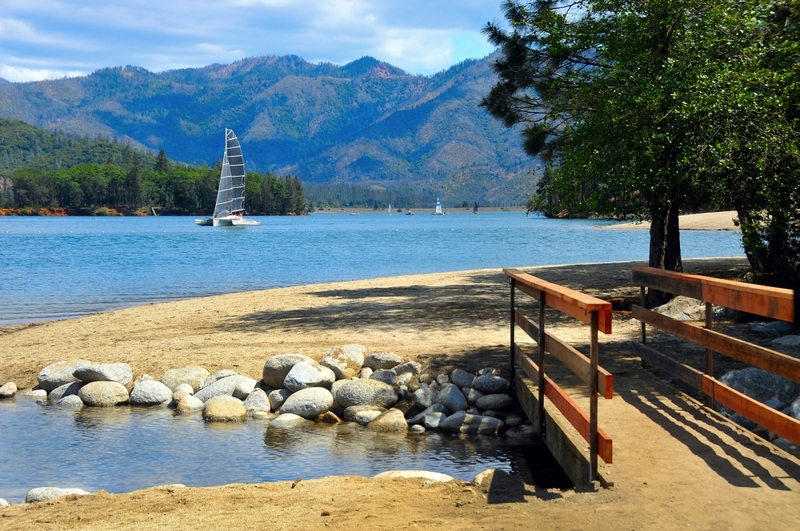 You can easily fill a whole day with a visit to the Whiskeytown National Recreation Area. There are plenty of recreation options on the beautiful lake filled with crystal-clear mountain water and surrounded by sandy beaches, hidden coves, and stunning mountain views. At over 39,000 acres, the area includes four waterfalls, over 70 miles of trails, a scenic drive around the lake and gold rush history. Services are limited so make sure to gas up and pack a picnic lunch, tons of snacks and water for the day. There is something about being outside that makes everyone extra hungry. Start your visit with a stop at the Whiskeytown National Recreation Area Visitor Center at the junction of Highway 299 and J.F. Kennedy Memorial Drive. Open daily from 10 a.m. to 4 p.m. Pick up a map, get hiking ideas and take in the stunning view from the parking lot. Ask about Ranger Programs. They actually have a free kayak program at Whiskeytown NRA. Plan to spend the day driving the loop and stopping off to hike, swim and explore. There are three beaches – Oak Bottom, Brandy Creek (pictured), and East Beach. There are lifeguards at Brandy Creek during the summer and concession rentals such as kayaks and standup paddleboards. Elsewhere in the park, it is swimming at your own risk. On my trip, we opted for a private cove off the beaten path. We followed a dirt and gravel road down to the lake and parked to swim, picnic and fish. Very relaxing and quiet, it was nice to have a place to ourselves. As you make your way around the loop, make sure to stop at the Tower House Historic District. It is a gold rush area. There are opportunities to pan for gold panning, touring the historic Camden House and other historical exhibits. Well worth the stop. It is a wonderful feeling when you are tired from a visit in the great outdoors to know that the drive back to the hotel is a short 20 minutes. It is hard to believe such stunning natural scenery is so close to town.